The most amazing part of this tanzanite and diamond "Only Us" ring is that it features a variety of colors that all match up well with each other. 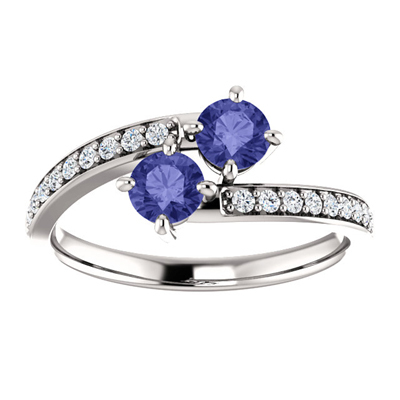 You'll get a ring that features a 4.1mm pair of tanzanite stones with some deep blue hues while the 14k white gold adds a light contrast. The 19 diamonds that equal 0.19 carats in weight especially add a strong look to your setup. We guarantee our Tanzanite and Diamond Two Stone "Only Us" Ring in 14K White Gold to be high quality, authentic jewelry, as described above.